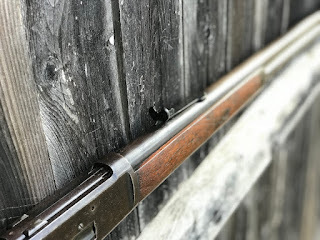 I put 50 rounds through my 1895-vintage Winchester 1892 in .38 WCF today out at a friend's. 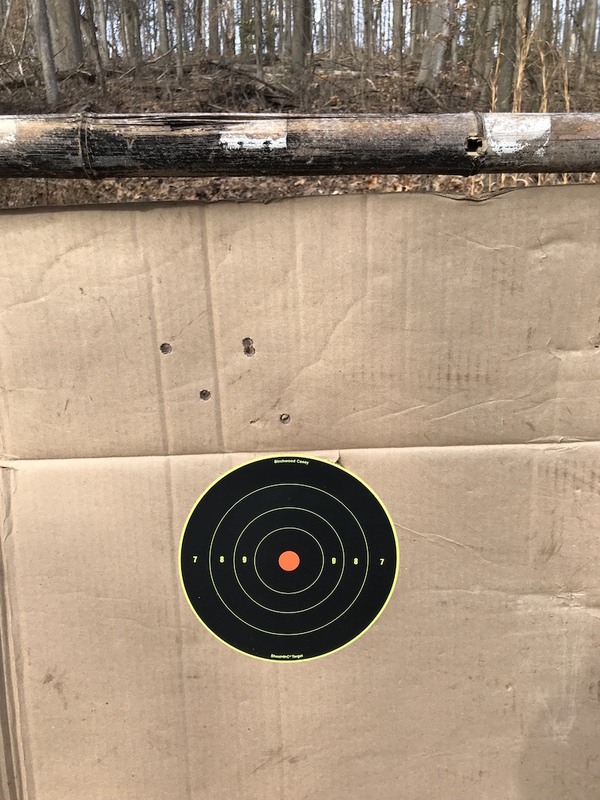 The target was my first 5 shots, from about 50 yards offhand. Point of aim (POA) was 6 o'clock on the bull. I'm hoping full power loads will shoot lower, and closer to POA due to less dwell time in the barrel, meaning the bullet will exit the muzzle before the barrel raises as much under recoil. 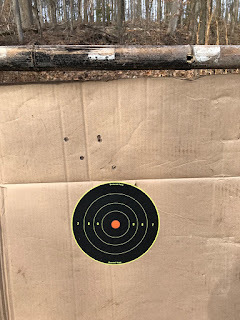 FWIW, I'm happy with the group considering the condition of the bore near the muzzle, and especially since my almost 50 year old eyes can barely use the microscopic notch in the rear sight. 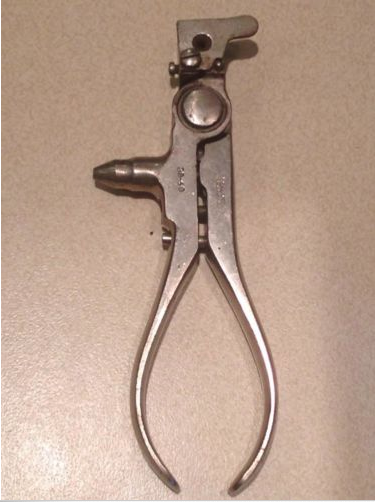 I am seriously considering taking advantage of the fact that the tang is drilled and tapped for a tang peep sight. 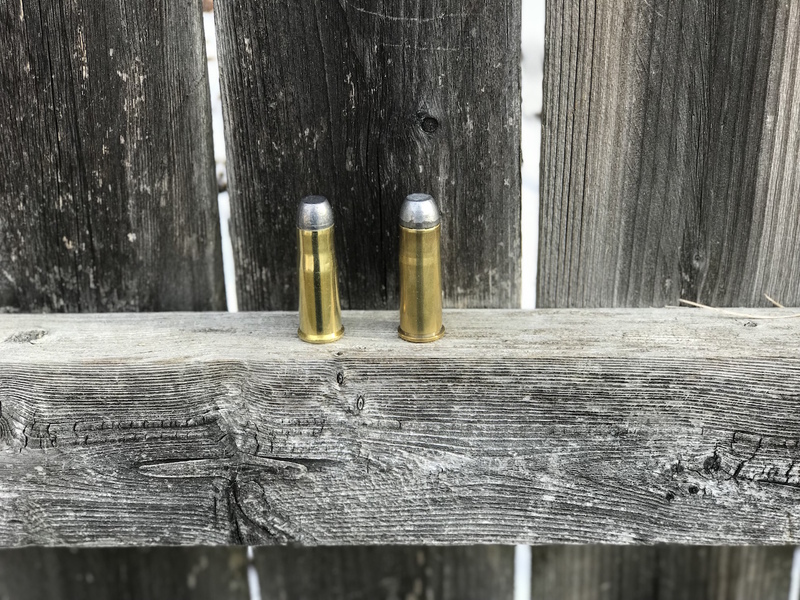 Recoil with the Ultramax cowboy loads was about like shooting a .22. Full power loads will have more kick, but it will still be a mild recoiling rifle. We didn't have any malfunctions. We mostly shot at an 8" gong, which the .38-40s smacked it pretty good. 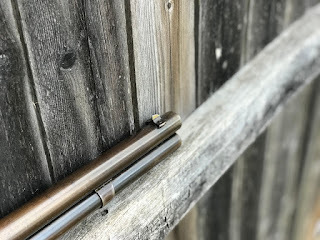 We also shot my Cimarron 1873 Sporting Rifle in .44 WCF a little with my handloads (200 grain cast lead bullet on top of 8.6 grains of Unique). Those really smacked the gong around. The flintlock in the picture is my friend's Euroarms Kentuckian carbine. A couple years ago he took a deer during the antlerless season, shooting out the window of his living room. He didn't even set off his smoke detectors. 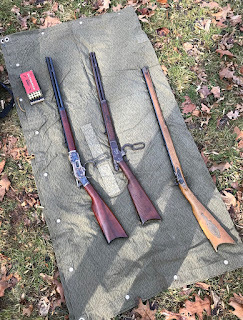 Today was the last day of this year's late flintlock season. He was considering taking the rifle on a walk around his property after we were done to see if he could fill his flintlock tag. After we finished up and I was standing there cleaning the rifle, and my friend had packed up all his stuff and taken it inside, a nice big doe came out about 25 yards behind our shooting position. Figures. It's a shame that my friend's land is within the SE Pennsylvania special regulations area, where breechloading rifles are not permitted for deer hunting. Either of these two leverguns would be perfect for deer hunting on his land, where 50 yards would be a long shot. 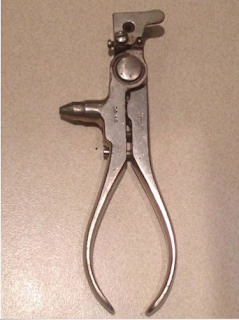 To add some icing on the cake, tonight I won an eBay auction for this Ideal Number 6 reloading tool for .38 WCF. Other pics from the auction listing show the mold cavity to be in good shape. 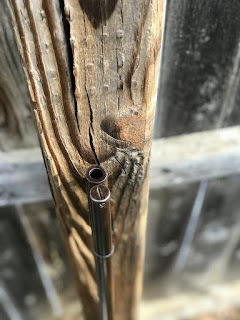 This will be really neat to load up some black powder handloads. Last night I discovered a failure mode that can affect Winchester rifles with toggle link actions. 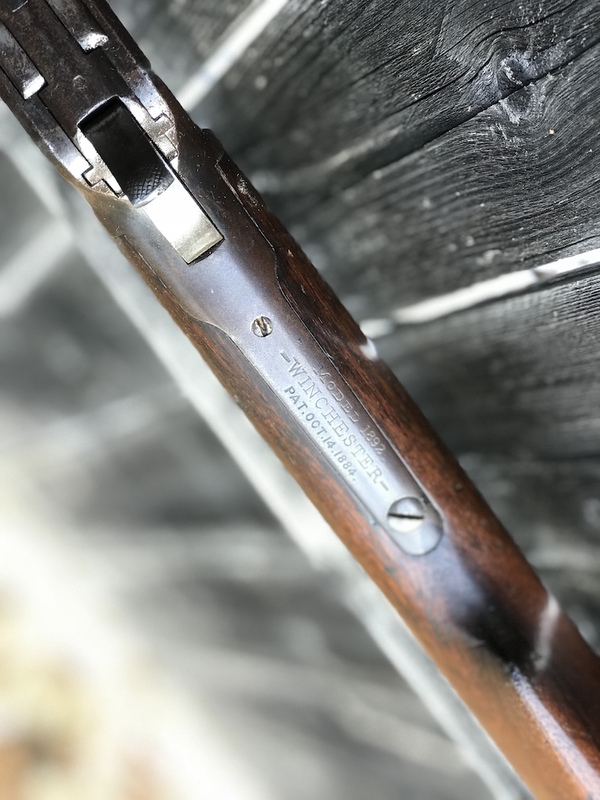 This applies to the Winchester 1866, 1873, and 1876 and replicas thereof. 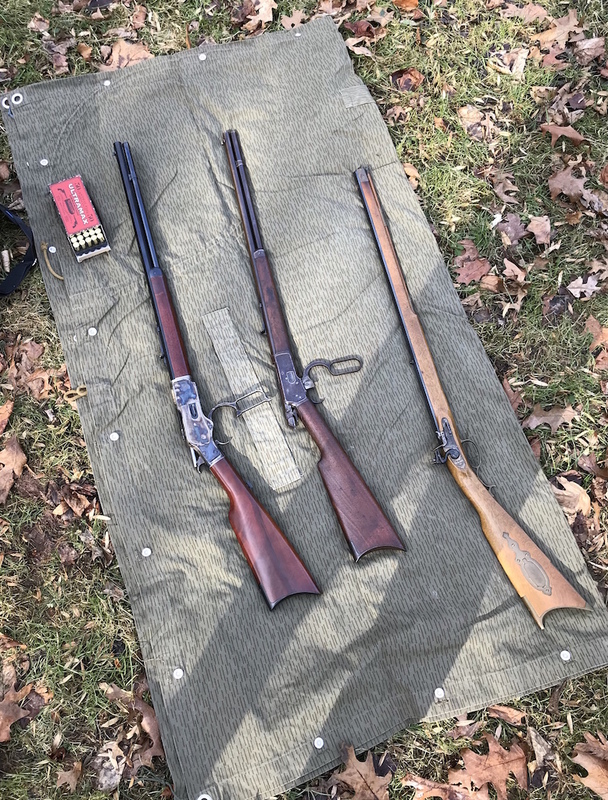 I had my Cimarron 1873 Sporting Rifle out. I opened and closed the action, then went to open it again and could not lower the lever more than about a quarter inch. I could press the carrier block upwards with a finger. After a few minutes of pondering, I snapped the hammer and was then able to work the lever, but again the action jammed. I repeated this a couple times and then removed the sideplates. Apparently the screw that holds the loading gate to the right sideplate was a little loose and backed out. It then interfered with the movement of the right toggle. Snapping the hammer jarred it back out of the way of the toggle. The loading gate is part number 127 on the exploded diagram at VTI Gun Parts. The loading gate screw is mis-numbered in the diagram; it should be 128. The solution is simple: degrease the hole for the loading gate screw in the right sideplate and Loctite it in place. I degreased the hole with rubbing alcohol and then used blue Loctite on the screw. It should stay put now. I recommend the owner of any of the potentially affected models do this as a proactive measure. The rifle arrived yesterday and I was able to take some pictures today. Overall, it's clean and the surface condition was as described -- mostly turned to brown with scattered pitting, but nothing major. Some of the screws have boogered slots. 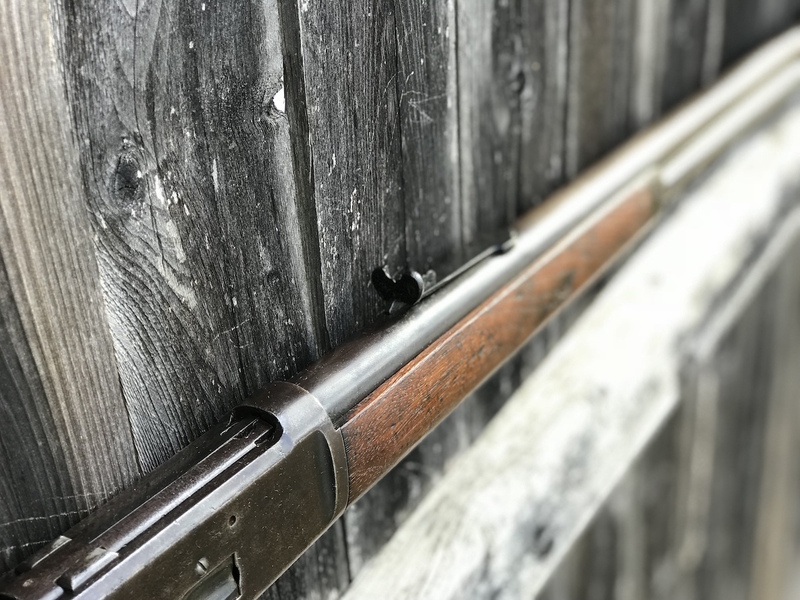 The bore is mostly clean and the rifling looks good, except towards the muzzle which shows wear from the use of a cleaning rod. The sights are in excellent shape, something you often find damaged on old guns. The action is solid and works very smoothly. I'm not going to attempt any disassembly until the Kroil I put on all the screws has several days to soak in. Click for full size pictures. Below left is an Ultramax .38 WCF cartridge, next to one of my .44 WCF handloads. I hope to get a range report fairly soon but I'm fighting a cold, so I'm not sure when I'll be able to shoot the rifle. 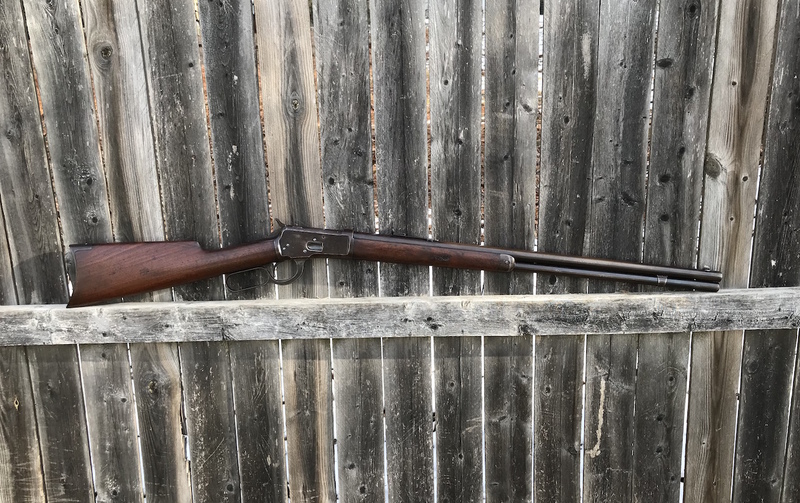 I've been getting the wants for another levergun and ran across a circa-1895 Winchester 1892 in .38 WCF (.38-40) at Simpson's Ltd. I called them up today, asked a few questions about it, and decided to order it. It should ship on Tuesday or Wednesday. 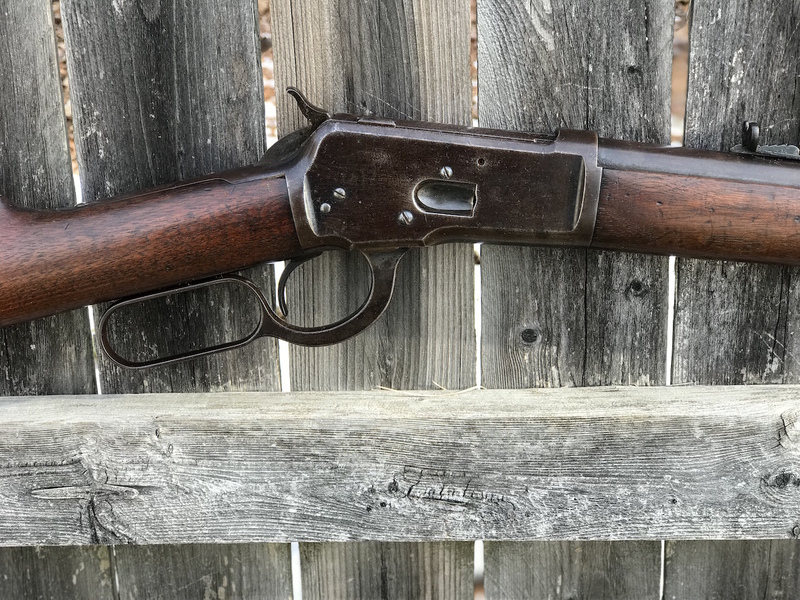 Since it was made before 1898, it is legally an "antique" and can be shipped right to my door, no FFL required. It's a Sporting Rifle with a 24-1/4" barrel and a 12 shot magazine. 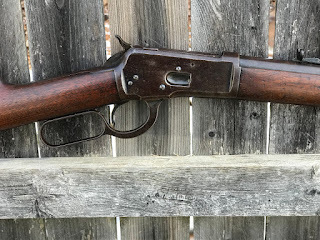 (I can get 14 .44 WCFs in my Cimarron 1873 Sporting Rifle, so it'll be interesting if the 1892 can actually be loaded up to the same capacity.) The rifles are not as handy as carbines but I find them easier to shoot accurately due to the longer sight radius. It might get a period tang sight. After I got off the phone with Simpson's I went over to MidwayUSA and ordered a couple boxes of Ultramax .38-40 cowboy loads. However, I plan mainly to shoot handloads since .38 WCF factory ammo isn't exactly cheap. I load black powder .44 WCF ammo for use in my Cimarron 1873, so I'm familiar with what's entailed. 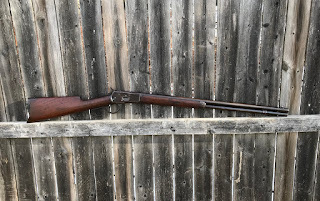 But I'll probably also try smokeless loads with Unique and Reloder 7, though I will not be trying to hot-rod a 125 year old rifle. I'm going to look for an original Winchester 1882 loading tool and mold, or an Ideal tong tool with an integral mold.